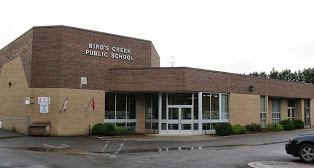 Located in the hamlet of Bird’s Creek, 5 kilometres north of the town of Bancroft, Bird’s Creek Public School serves 160 Junior Kindergarten to Grade 6 students. Students have access to a spacious library, full-size gymnasium, well-equipped playground and an after school program. The school provides a safe and healthy learning environment based on mutual respect and inclusionary practices. Staff, parents, students, school council and volunteers share the responsibilities for student achievement. Students participate in the Silver Birch and Blue Spruce Library Programs. Bird’s Creek PS is a Healthy Active School Community. Bird’s Creek PS students proceed to York River Public School in Bancroft for Grades 7 and 8. Bird's Creek School Council along with the School Councils for Maynooth, York River and Our Lady of Mercy are bringing renowned speaker Paul Davis to Bancroft on May 2. He will be speaking at OLM from 6:30 pm onwards. Dinner and child care are being provided (free of charge) to all parents and caregivers who are interested in what he has to say. You are encouraged to bring your phone and/or tablet. Paul Davis is a dynamic speaker who knows his topic of online safety so well, that no one in the audience even considers tuning out for one second! He brings over 27 years of IT knowledge and expertise to his speaking engagements. He has presented to over 510,000 students from Grades 4 - 12 throughout North America, as well as presenting a TEDx Talk. Please come out and join us and learn about the Social Media sites your children are using and how to keep them safe online. We are having a Fun Fair planning meeting on Tuesday, April 16 at 6:30 pm in our Learning Commons. All are welcome to join us. Juno Award Winner Mary Lambert is coming to BCPS! We want to thank all those parents who have already registered for School CashOnline. Many ordered pizza for lunch for their children and purchased milk punch cards. The feedback has been great, a very convenient system. If you have not already done so, we would ask that you register - whether you plan to purchase or not. In future we may be using this system to send messages home. Please follow up on Facebook. We keep our Facebook page up to date. It is a great place to go for the latest news and/or pictures.